For most has become customary that the sleepers are made of wood, impregnated with special compounds. However, wood is gradually replaced by other materials, for the production of which used innovative technology. Used for the manufacture of wood spruce, pine, maple, oak, cedar and even eucalyptus. Sleepers can be of three types. The most basic one involves the production of material, cropped only top and bottom. Improved – machining from 3 sides (Palabrescia products). The most qualitative considered sleepers, treated with 4 sides. To prevent the process of decay uses different impregnations on the basis of creosote is the strongest antiseptic. Before processing future sleepers well dried, is placed in a vacuum and serves antiseptic. Drying will also take place in a vacuum created by a special autoclave. Sleepers of wood easy to produce, have small weight and small price. 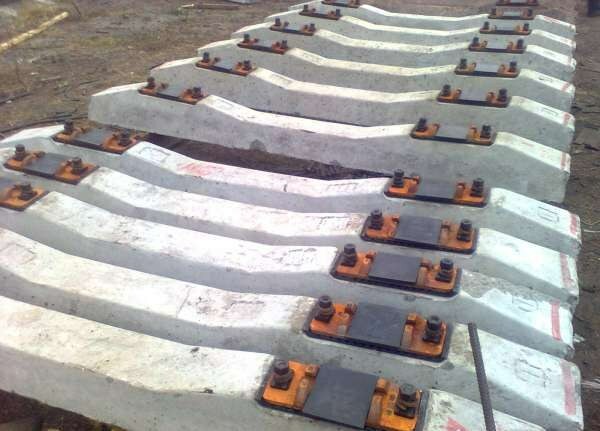 Sleepers made of this material represent a beam with variable cross section, "equipped with special pads under the rails. For the production of such products used heavy concrete with a high compressive strength (C40) and good frost resistance (F200). In addition, future sleepers are subjected to pre-tension. For the production of concrete sleepers used forms that transmit tensile forces. After poured concrete hardens, tension from the rebar is removed, the form is destroyed. The resulting product has a high resistance to stress when the train moves, and intense reinforcement prevents the split of the concrete at point of impact. Reinforced concrete sleepers are more expensive to produce compared to wood, higher weight (260 kg), but have a higher performance and a longer (almost unlimited service life. Another important advantage of reinforced-concrete sleepers – the possibility of reuse. Yet this material for the manufacture of sleepers is rarely used, but gradually the production is growing. The leader here is the United States, producing up to 15 million ties per year (the approximate cost 500 million dollars). For the production of plastic sleepers using composite materials that have proven themselves in the construction of bridges (panelling). This composite composition is widely used for the manufacture of marine piles, piers. Engaged in the production, several companies managed to negotiate standards on sleepers and to test them. The weight of the products is 200-280 pounds (here the role played by production technology and the length of products).